Both sides withdrew their troops according to a previously negotiated agreement. Chinese and Indian troops have both withdrawn from a disputed border region, China’s Foreign Ministry announced Wednesday. The mutual withdrawal ended a two-week long stand-off that cast a shadow over Chinese President Xi Jinping’s first official visit to India. 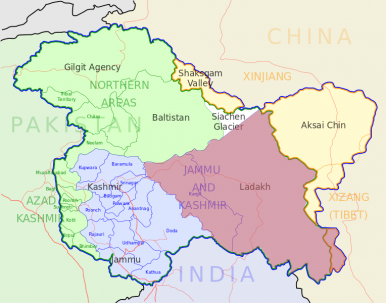 The stand-off in the disputed region of Ladakh began just prior to Xi’s arrival in India on September 18. PLA troops crossed the Line of Actual Control (LoAC) that separates Indian and Chinese-controlled territory. The PLA troops were met by Indian forces; at the height of the stand-off, each side had about 1,000 troops in the area. The stand-off continued until late last week, when Indian Foreign Minister Sushma Swaraj and her Chinese counterpart, Wang Yi, met on the sidelines of the United Nations General Assembly in New York. “Both nations sat down and resolved it,” Swaraj told reporters after the meeting. The two sides agreed to withdraw their troops to their previous positions on either side of the LoAC. Withdrawals began on September 26 and wrapped up September 30. China’s Foreign Ministry confirmed that the process had been completed as planned. “On Sept. 30, the frontier defense troops of the two countries completed simultaneous withdrawal according to the steps formulated by the two sides and restored peace and tranquility in the area,” the ministry stated in a press release. At the same time, however, Modi called for a “satisfactory resolution” of the border issue, a stance that Xi echoed as well. Speaking at the Council on Foreign Relations during his U.S. tour this week, Modi again expressed his confidence that “India and China are capable of resolving issues through talks.” Both sides have in theory indicated their willingness to negotiate a settlement to the issue, but the devil, obviously, is in the details — the give-and-take and compromise that would be required to solve the border dispute. In the meantime, both sides stressed that border stand-offs could be a result of misunderstanding rather than malice. In a monthly press briefing, a Chinese Defense Ministry spokesman emphasized that “it is quite natural for some incidents to happen along the China-India border” because the border is not demarcated. During a press conference during Xi Jinping’s visit, Modi agreed that confusion over the exact location of the LoAC caused many of the border incidents. He suggested that China and India resume talks to clarify to LoAC. With the recent stand-off resolved, both sides now have a new opportunity to make good on their promise that the border issue will not hinder the overall bilateral relationship. Can China Keep India Silent Over the South China Sea? China wants to make sure India does not raise the issue at the upcoming G20 Summit. Can China Woo India to the Maritime Silk Road?China and India Want a Breakthrough on Their Border DisputeCan India and China Overcome Their Border Dispute?Chinese Foreign Minister Makes Inroads With Modi GovernmentWhat's Next for Sino-Indian Ties After Wuhan?